As much as I enjoy reporting on and reviewing products from the big and glamorous names of the industry, it’s the niche-within-a-niche discoveries that provide me with a wakeup call in terms of the passionate endeavours of small cottage operators. In what could be akin to marketing inside anechoic chambers, these small players usually begin operations by commercializing a product or two that were the result of highly developed craftsman skills or a love for design, a passion for music, demands from friends - or all of the above. One such pleasant surprise discovery are TC Loudspeakers, a small cottage company run by principal and designer Tony Caloia who started operations around 2000. TC Loudspeakers operate from the beautiful coastal town of Forster, a location where, coincidentally, I spent many a family holiday. Coastal wind-blustered cafes and casual restaurants line the absolutely stunning beaches that actually continue north and south all along Australia’s east coast. As conducive as the idyllic location is to recreational activities of the outdoor type, Tony Caloia pursues a more indoor endeavour. 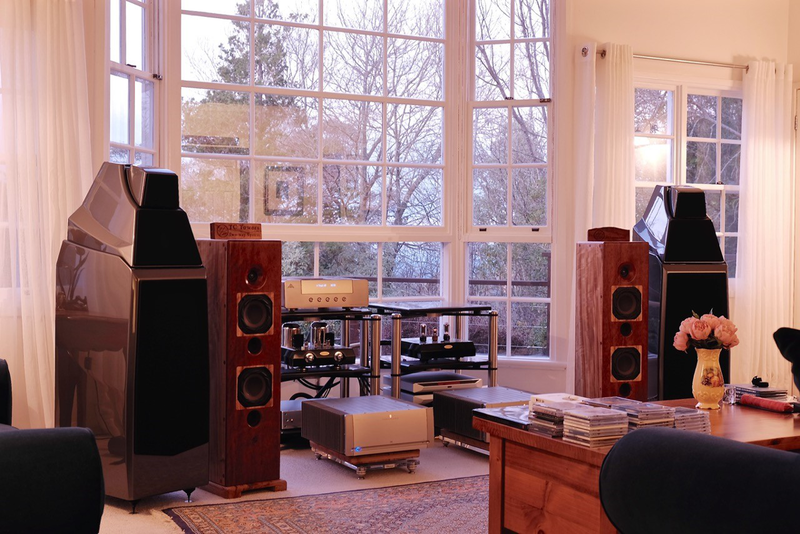 He produces quality loudspeakers as conduits to his love of music whilst his equally fervent love of natural timbers and his remarkable woodworking skills see him create bespoke designs in a multitude of stunning solid wood species. Caloia can truly be called a master craftsman when it comes to the construction and finish of his creations. He’s acquired the CNC routers and woodworking machinery to practice his art and construct bespoke cabinets for all of his TC Loudspeakers designs. As they say, the images posted to support this review do not do the speakers justice, such is the beauty of the wood and excellence of its finish. The TC-Towers 2 speakers under review were absolute stunners.